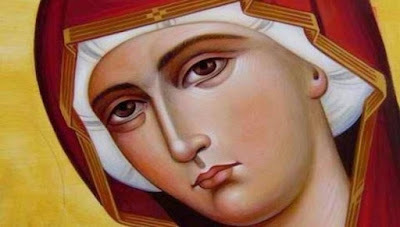 The person of the Panagia, much more so her ministry in the unexplainable mystery of the Incarnation of the Son and Word of God, is truly a miracle. How did God become man in the womb of a woman and how did a woman carry God in her immaculate womb and in her warm embrace? The God-bearing Damascene, the great dogmatician of our Church, describes it as a miracle. In one of his homilies he writes: "O Virgin full of divine grace, holy temple of God which the Spiritual Solomon, that Prince of Peace, constructed and inhabited; you are not adorned with gold and lifeless stones, but in place of gold you shine with the Spirit. Instead of precious stones you have Christ, 'the pearl of great price', the coal of divinity. "1 Thus she became "the rectification of our foremother Eve" with the descent of God to the human race and the ascent of man to God. The new Eve rectifies the erroneous action of our foremother Eve and at the same time lifts the human race from corruption and sin. With particular astonishment at this rectification the sacred hymnographer of the kontakion of the Akathist Hymn chants: "Rejoice the rectification of humanity." With this ministry of the Panagia in the mystery of the incarnation, the Only-begotten Son and Word of God becomes the descending, in order to become then the ascending man. God used His love towards people as a ladder, descending to the lowest parts of the earth to meet us, cleanse us and wash us from our sins, in order to gift us with the grace of the Holy Spirit, and take us to His royal throne in His heavenly Kingdom. The person of the Theotokos who is Full of Grace is a minister of this rectification of humanity. - do we experience this rectification she gave us by her ministry? - do we stand at the height to which Christ honored us? - do we live in the world from a theocentric angle and not an anthropocentric one, raising to the position of the God-man the idols of our age? - do we hope and expect in His person and His Kingdom and not in the perpetual pursuit of wealth, pleasure, selfishness and self-love? - do we hope in God? - do we trust in His providence? - do we believe His promises? - do we ask for His Kingdom to come on earth as it is in heaven? If not, then we need to flee with much trust to our caring Mother, and fervently ask her for her motherly intercessions and entreaties to Him whom she bore that we may live in spiritual recovery, which she gave us. - every ailing soul, that they may be healed of their passions and sufferings. "Rejoice the rectification of humanity!" 1. Homily on the Nativity of the Theotokos. 3. Commentary on the Gospel of Luke, Sermon 2. 4. Christmas Matins, Ode 1. 5. Exact Exposition of the Orthodox Faith, PG 94, 1032B. 6. Theotokarion, Sunday, Ode 9, Tone 4.